Emelie Backlin is one of our talented final year BA Technical Arts & Special Effects students who is exhibiting her work at the Undergraduate and MFA Fine Art Summer Show this year. 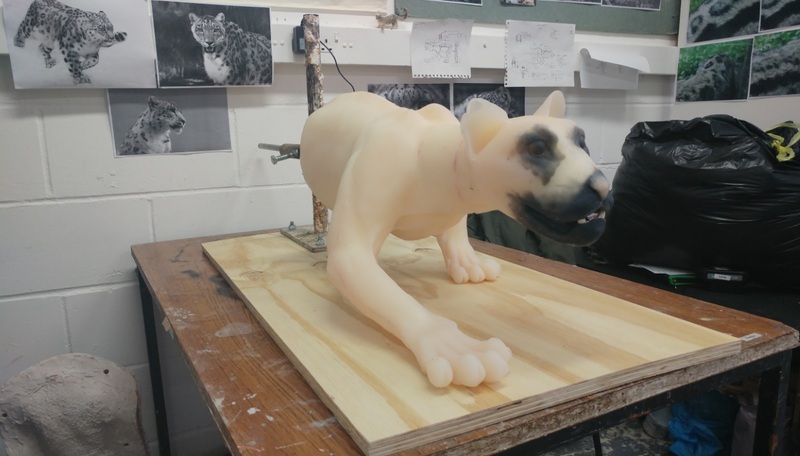 We spoke to Emelie about her experience of the Technical Arts & Special Effects course, the methods and materials behind her impressive snow leopard sculpture and what she hopes to do after graduating. 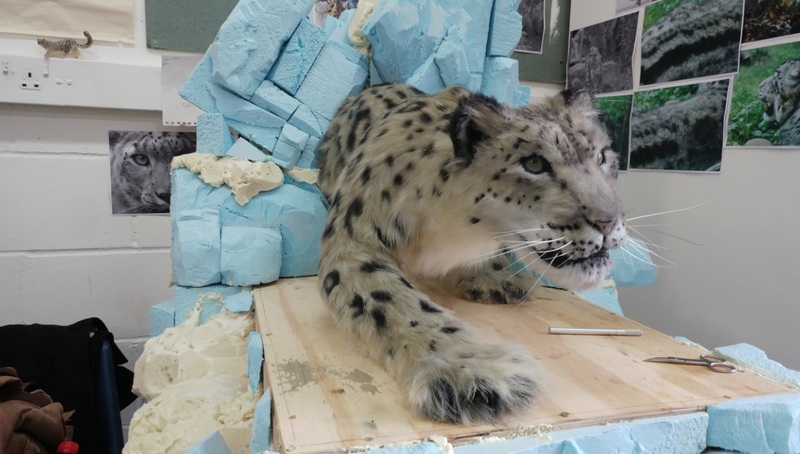 Why did you decide to make a snow leopard for your final project? In first and second year when I was starting to think about it, I had a completely different plan of what I wanted to do. When second year ended, and I had to choose what I was going to make, I changed my mind completely. I decided to make a cat because I wanted to try working with fur, and I am really passionate about wildlife and endangered species. I also donate money to a charity each month that works to conserve big cats. A tiger was a bit too big to make, so I decided on the snow leopard. Snow leopards are really beautiful and I really like them. They’re also endangered and I think it’s important that people know that we should try our best to save them. What was the process of making the snow leopard? Firstly I made an armature, out of metal that I had welded together. Then I sculpted in wet clay on top of that, so I had to build up the muscles, the cranium and everything else. After that, it was moulded and casted. For moulding I used transparent silicone that you can add pigment to with a fibreglass casing. You can put it on in layers and slowly piece it together and out comes a naked cat basically! Then I filled it up with soft foam to make it a bit soft and squishy and give it stability. After that I hair punched and glued the fur on, which took months! For hair punching, you have to use a small needle and you push in hair after hair after hair over the entire surface of your sculpture. I hair punched most of it, but some of it is fur transfer that you glue down and brush through. I ordered the eyes in and I had to fit them in by cutting around the eye area. I made the teeth as well by moulding and casting them in resin. For the painting on the fur, I used an airbrush to get an undercoat of yellow and then I did another coat of light grey and then I did the spots. The ones on the face that are smaller were done with a marker, but the bigger ones are airbrushed. Right now I am working on the final touches so I am putting in whiskers, I need to clean up the eyes a bit and I need to make the mouth appear wet and then it’s done! It has taken about 700 hours altogether, so quite a lot of time! The idea is that the snow leopard will be coming out of a cave, and I am making the cave myself also. I am constructing it out of blue foam and some expanding foam and I am covering it in Jesmonite. I am using a Dremel to get a bit of texture on it, so it looks like rock, and then I’m painting it. What has been the most challenging part of making the snow leopard? The actual sculpting was challenging, but really fun and I think the casting was the most tedious part. The silicone takes about two hours to dry and you have to do one little piece at a time. It takes weeks to do! The hardest part by far was the hair punching. Getting all of that fur on the body was really difficult. I love the fact that you can make so many different things and you learn so many different methods that are really useful. You can use what you learn to create basically anything you want! I have worked on so many interesting projects throughout the course. In first year we did the replica project and I made a Jammy Dodger, then I made a puppet which was a big rat. In second year we sculpted a torso from life, and then we did prosthetics and I made an old face with a big pointy nose and a double chin, then for our Design and Make project I made a dragon. 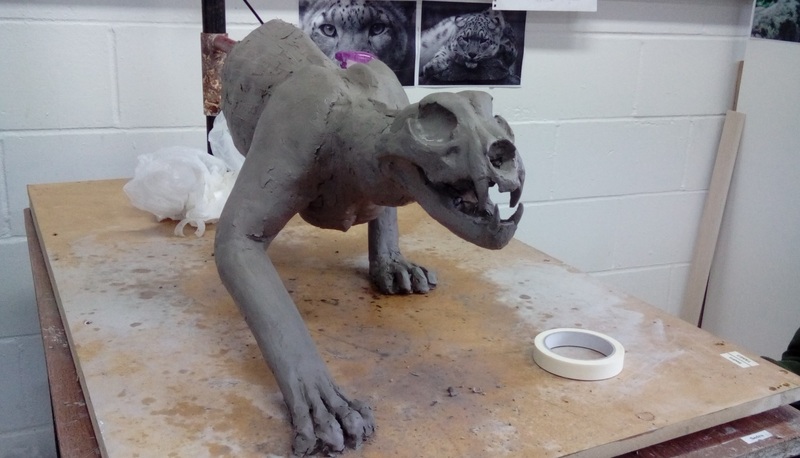 The life modelling skills we learnt ended up being very useful for sculpting an animal, because they teach you anatomy and to look at the muscles and how they attach. You can apply those skills to sculpting basically anything organic. What kind of things do you want to do when you leave? I just want to make things, I love making things! Props, costumes, sculptures – all these kinds of things. It’s really difficult to pinpoint exactly what I want to do, but as long as I get to make things I will be happy! You can find out more about Emelie and her work by following her on Facebook and Instagram. BA Technical Arts and Special Effects and BA Set Design for Screen have combined under a new course called BA Production Arts for Screen. Learn more about studying BA Production Arts for Screen on our website.